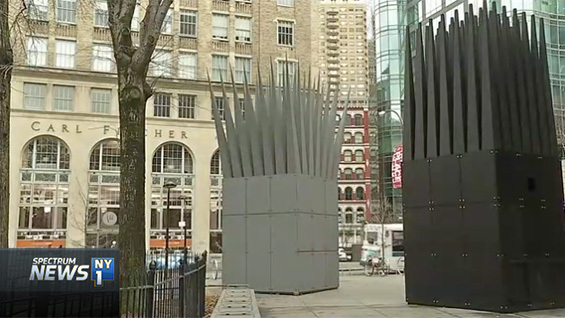 The cable news channel NY1 featured a two-minute spot on the John Hejduk Works/Jan Palach Memorial exhibition. Comprised of two 23-foot-tall structures outside the Foundation Building, as well as an exhibition in the Arthur A. Houghton Jr. Gallery of other Hejduk built works as photographed by Hélène Binet. The NY1 spot features Steven Hillyer, director of the The Irwin S. Chanin School of Architecture Archive, speaking about meaning of building the works to The Cooper Union, where John Hejduk both graduated (AR'50) and taught, becoming dean of the school of architecture from 1975 to 2000. "To be able to celebrate his work at The Cooper Union anytime is an amazing thing but to be able to do it this way is off the charts," Steven Hillyer says.